This is the list of 5 free websites to get Cryptocurrency price alerts. On these websites, you can choose your target cryptocurrency and set an alert to receive the change in its price to your email inbox or messenger. In some of these websites, you can add unlimited trackers and keep receiving alerts. While in some of these websites, you will only get limited number of alerts. While creating an alert, you can choose a cryptocurrency, a market, and a triggering action. In triggers, you can set price drop, price increase, price in between a range, etc. And then you can leave the rest to these websites. When a trigger fires, you will receive the alert message to your email address or in Telegram or Messenger. There are some cryptocurrency tracker extension for Chrome and Firefox are available, that you can use. 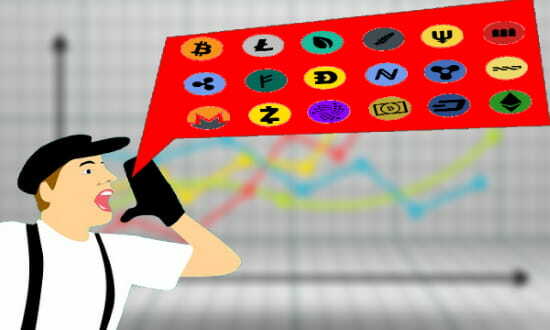 But if you want to get alerts on Cryptocurrency price while you are out, then you can rely on any of these websites. You just have to specify the alert parameters and forget about the rest. You will always receive the alerts on the cryptocurrency prices. There are up to 11000 cryptocurrencies supported and you can set alerts on any of them. And in case you want to change the alert parameters, then you can do that. Coinwink is one of the simplest and a free website to get cryptocurrency price alerts. It allows you to create an alert on long list of cryptocurrencies like BTC, ETH, LTC, EOS, DASH, TRON, Cryptonex, Ethos, Bitcore, Storm, SpankChain, INK, and a lot others. And the best part is that, here you are not required to create an account to get email alerts. You can specify the alert parameters and specify your email address. It will give you an unique ID that you can use to change the alert parameters and even delete that alert. But, if you want to get SMS notifications, then you will have to sign up for an account and that feature is not free. Coinwink is an open source tool to get cryptocurrency price alerts. You can get to its homepage using the above link and then set the alert for your favorite cryptocurrency. You can specify to get alert when the price of the chosen coin goes above or down than the specified amount. Next, you can hit “Create alert” button and it will send an id to your email. You can use that id to edit the alert and even delete that. After setting an alert, you will start receiving the cryptocurrency alerts. 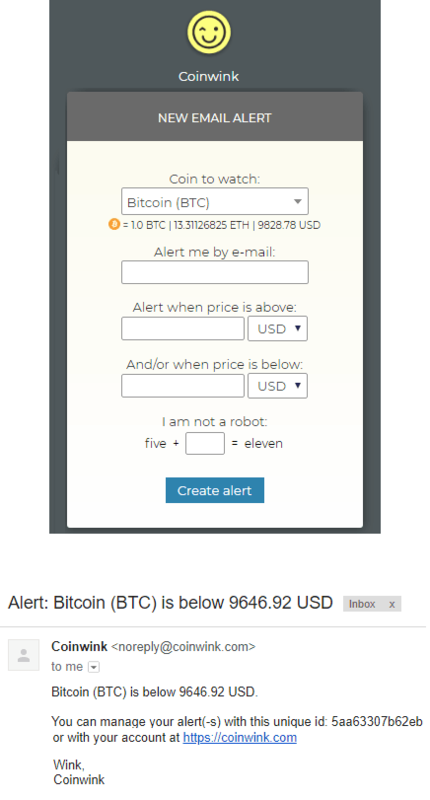 You can use the same email address to create multiple alerts for different cryptocurrencies. 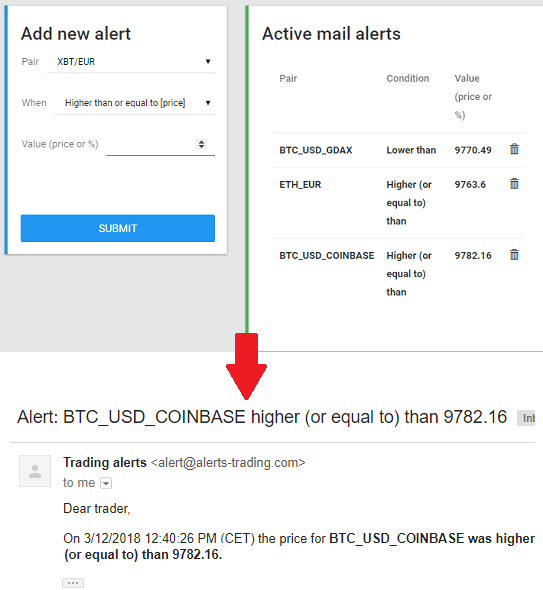 CoinMarketAlert is a websites that also lets you create cryptocurrency price alerts and receive them on your email. You can use the “CRYPTO TRADER” tool of the websites without any registration in the same way as I have explained for the website above. You can set unlimited price alerts and receive them all into your email inbox. You can choose crypto currencies like Bitcoin, BitcoinDark, BicoinZ, Bitsend, BOAT, ChessCoin, Cheapcoin, Crown, Crypto, EcoCoin, Ethereum Lite, and a lot others. You can specify the above price, below price parameters along with the price in USD, BTC, AUD, other currency to get an alert. It will give you a unique id to manage your alerts. 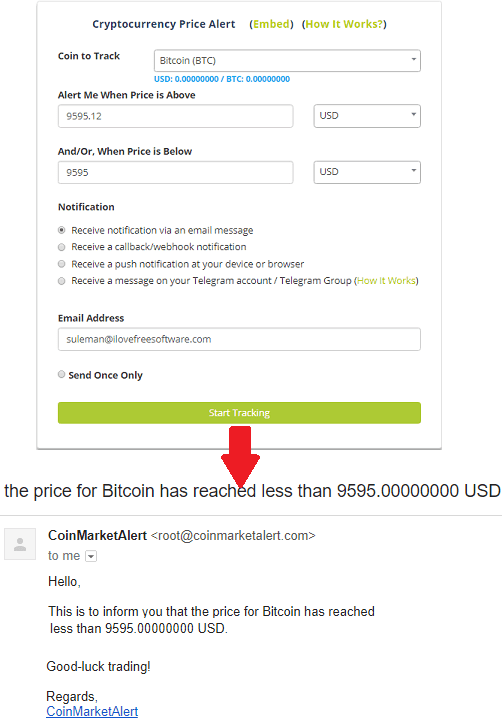 You can use CoinMarketAlert in the same way that I explained for the website above. To create cryptocurrency price alerts, you don’t have to sign up for an account. Just go to its homepage and then set the alert. Specify the alert parameters like price drop, price down, the target price, cryptocurrency to track and your email address. Finally, create alerts and it will send you an id that you can use later to manage alerts. 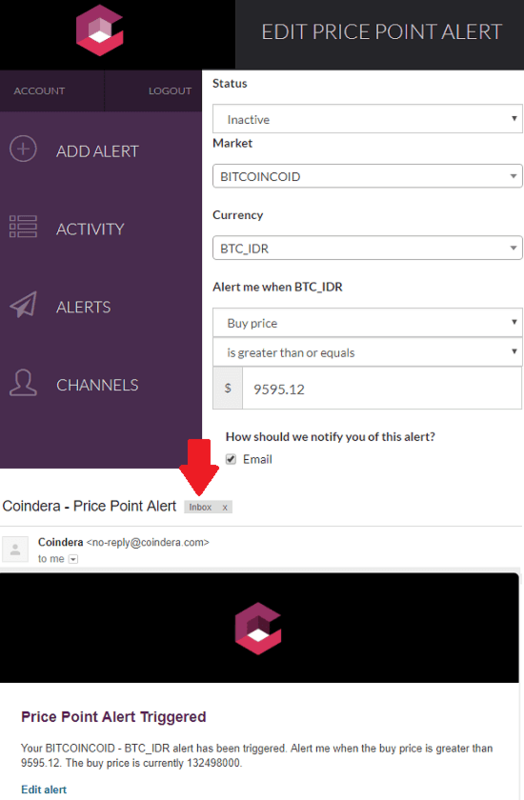 Coindera is another free website to get alerts when your desired cryptocurrency price increases or decreases. In the free plan, it lets you set 5 alerts and receive the notifications on email, Pushover, Telegram, and SMS(you will have to buy credits). It has upto 11000+ cryptocurrencies in it and 30 markets. It lets you create alerts by choosing a desired cryptocurrency and a market. And when the specified criteria meets, it triggers the alert and you will receive an email. However, you cannot use this website without registration. In order to get started, you will have to create a free account. You can go to the homepage of the Coindera using the link above and sign up for an account, verify it. After that, go to the “Add Alerts” sections and then create an alert. You can choose a cryptocurrency to watch, the market, and the price amount. Next specify when to trigger this alert and then save it. You can even opt to receive the alerts on Telegram, but for that you will have to verify your account. Next, when you are all set, you will start receiving alerts. And you can always manage all your alters from the “Alerts” section of the website. alerts-trading is yet another free website to get cryptocurrency alerts. It has some limited pair of cryptocurrencies that you can opt to track and get alerts. It shows the current prices of various cryptocurrencies from GDAX, Coinbase, Kraken, HitBTC, and some others. You can use this website to track and get alerts of cryptocurrencies like XBT/EUR, BCH/USD, ETH/EUR, BTC/USD, XLM/XBT, BTC/ADA, BTC/NEO, NEO/BTC, and a lot others. You can add so many email alerts and specify the triggering parameters. After the succesul configuration, you will start receiving the alerts. Just go to the website of alerts-trading and then sign up for a free account. Next, you can specify the triggering parameters to receive the email alerts. You can configure alerts from the bottom left side of your dashboard and by specifying the corresponding parameters. You can select the cryptocurrency pair that you want to monitor and get alerts. Next, you can specify the triggering action whether you want to receive email when the price of the specified currency drops, increase, or becomes equal. Finally, save the alert and it will notify you whenever the specified conditions meet. Coinoxo is the last website in my list to get cryptocurrency price alerts. In the free plan, you can set 3 alerts and receive them to your email, Telegram, etc. In addition to this, it lets you create a portfolio of cryptocurrencies by adding 3 coins in the free plan. By creating a portfolio, you can keep monitoring the price of any cryptocurrency. You can add tracker to the price of any coin and see the increase or decrease in its buying or selling price. In the alerts section, you can add 3 different alerts by specifying the desired parameters. It supports a wide array of cryptocurrencies to watch for the price change and notify you via email or any other medium. You can select any coin and then specify the corresponding parameters. And you can setup this all using the “Price Alerts” section of the website. And apart from email alerts, it supports Telegram, and app notifications. Based on your interest, you can choose any. These are the best websites to get cryptocurrency price alerts for free. You can easily use them to create many alerts to your favorite cryptocurrency and get the notifications directly to your email, messenger and SMS. Some of these websites are very good and allow you to set unlimited alerts. While some of them allow you to only set limited number of alerts. I really like all of them to get prices alerts but I will suggest you to use Coinwink, CoinMarketAlert, and alerts-trading.